Enhanced productivity and competitiveness and significant cost reductions: that is the return that Stader Saatzucht eG is experiencing after having used ca. 70 TX-MAX on-board computers from fleet management expert Transics for a few years now. Benjamin Ney, fleet and logistics manager at Stader Saatzucht, further highlights how the practical combination of TX-ECO technology and driver trainings has helped his company cut fuel consumption by approximately 7%. Considering that the diesel consumption at Stader Saatzucht amounts to 1.2 million litres per year, this 7% saving represents a large amount of money. During the 4th Practice Symposium on Telematics organised by trade magazine VerkehrsRundschau, prof Heinz-Leo Dudek of the Duale Hochschule Baden-Württemberg in Ravensburg recently demonstrated that the use of telematics can yield a saving of between 200 and 400 euros per vehicle per month in the long term. More than helping transport and logistics companies save costs, telematics also boosts improvements that are more difficult to quantify, such as smoother planning cycles and improved transparency for the customer. 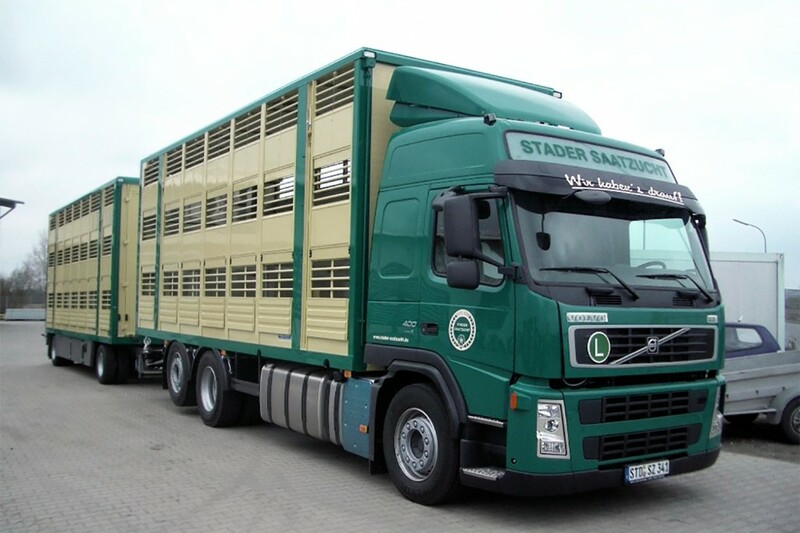 All the vehicles of Stader Saatzucht are connected to the company’s LIS dispatch software, the GWS ERP system and the Ibix payroll solution. Transics’ TX-CONNECT fleet management system is linked through Web-based services, which is an easy as well as a cost-effective solution. The individually-tailored transfer of freight orders means no loose ends. The order-specific navigation ‒ together with the order-driven management of the workflow ‒ puts less of a strain on the driver. TX-DOCSCAN, Transics’ mobile document scanner, allows drivers to forward transport documents from their cab, thus speeding up the billing processes while improving cash flow. The refuelling procedure further avoids multiple entries of data, while the departure check increases security. To make sure the carrier complies with Good Manufacturing Practice (GMP) guidelines and EU drivers’ hours regulation, whilst ensuring accurate calculations / invoices for the customers, a fixed procedure has been drawn up for loading checks and loading and unloading actions. The systematic availability of trip and route details, as well as of “Points of Interest” (POIs), avoids expensive extra kilometres, helps save time and streamlines workflows. And that’s not all … Thanks to the combination of Transics’ TX-ECO technology, driver trainings and permanent feedback, Stader Saatzucht gains clear insight into the driving behaviour of each of its drivers. In this way, the company has objective proof if specific training sessions are needed. The analysis and introduction of training programmes motivate the drivers and lead to long-term savings. TX-ECO is a leading telematics solution to improve driving behaviour. It constantly delivers information on fuel consumption, speed and distance travelled. The integrated driving style analysis tool shows drivers clearly why the fuel consumption of their truck decreases during the training and their average speed increases. Anticipating driver behaviour leads to less braking and less emissions of hazardous substances / pollutants. The fleet management implemented at Stader Saatzucht eG also comprises a comprehensive solution to manage digital tacho data. It helps carriers record and forward real-time driving and resting times and download data from the digital driver card, without the need for additional hardware integration into the on-board computer. The time saving and secure Transics solution also permits the remote read-out and archiving of the digital mass memory. Thanks to the display and transfer of available working and resting times, freight planning and scheduling is now based on up-to-date information. As the system notices when the driver takes too short a break and sends out an alarm in that case, fines are avoided. TX-SOCIAL also supports the carrier in meeting sustainability and social security regulations. Last but not least, Transics offers a new, innovative fleet reporting platform: TX-DASHBOARDS. This solution allows fleet owners to measure their operational performance, visualise it at a glance and continually compare vehicles and drivers with the predefined objectives. In the event of deviations, they can then immediately take the necessary corrective measures. TX-DASHBOARDS is based on preconfigured starting data, which it interprets based on four key ROI criteria (Return on Investment): vehicle and driver efficiency, fuel consumption and level of customer service. With 380 employees, an annual turnover of EUR 280 m and over 30 regional offices in the northern German counties of Stade, Rotenburg / Wümme, Cuxhaven, Harburg and Heidekreis, Stader Saatzuch eG is one of the leading cooperatives of the German cooperative union. As a cooperative, feed manufacturer, catering and logistics service provider with flexible storage, transport and logistics services (annual volume: 860,000 t), Stader Saatzuch has a fleet of around 70 multiple-chamber silos, tipping and general cargo vessels (tractor-trailer / motor vehicle trailer), roll-off containers, agricultural trailers, train tanks and livestock transporters. Established in 1991, Transics International NV develops and commercialises fleet management solutions for the transport and logistics sectors. Thanks to many years of experience, thorough R&D efforts and an intensive focus on the customer experience, Transics has become the leading European player in its market. Headquartered in Ypres (Belgium), Transics is active throughout Europe. Transics Deutschland GmbH is located in Cologne.